+1 to good dealings with maven. Any recommendation where to get a new tire for my old Camry, preferably a place that can repair tires also (Incase this one is repairable) a used tire would also be fine. located in Brooklyn. Thanks, my tire has a bubble coming out on the side so I guess it's not repairable I got a car wash last night and all of a sudden this morning I saw the bubble on the side of the tire, I'm not going to fight with them because I'm not %100 sure that they damaged my tire, and even if I was it would take too much effort to get a dime out of them. How much does a standard used tire + installation cost over there? And is it a Jewish owned? Thanks, my tire has a bubble coming out on the side so I guess it's not repairable I got a car wash last night and all of a sudden this morning I saw the bubble on the side of the tire, I'm not going to fight with them because I'm not %100 sure that they damaged my tire, and even if I was it would take too much effort to get a dime out of them.How much does a standard used tire + installation cost over there? And is it a Jewish owned? I'm looking to buy a portable jumpstarter for my car. What specs should I be looking for? It's for a full size sedan. I guess this is the right place to ask this. We plan on getting a new car pretty soon, something not too fancy. We got a new truck a couple years ago and its great but our one car is getting a bit old, it's a 1997, Toyota! All the cars we are looking at don't offer remote staters (compact and mid-size sedans) and as the winters here in Butte are freezing, I'd like to get one installed aftermarket. We've also head horror stories about things like engines turning off and starters getting destroyed from the remote starter. Any truth to those or just urban legends? The only problem is that if you don't use it somewhat regularly, it may start to not hold a charge as well. You will get quite a few boosts out of this on a single charge btw. 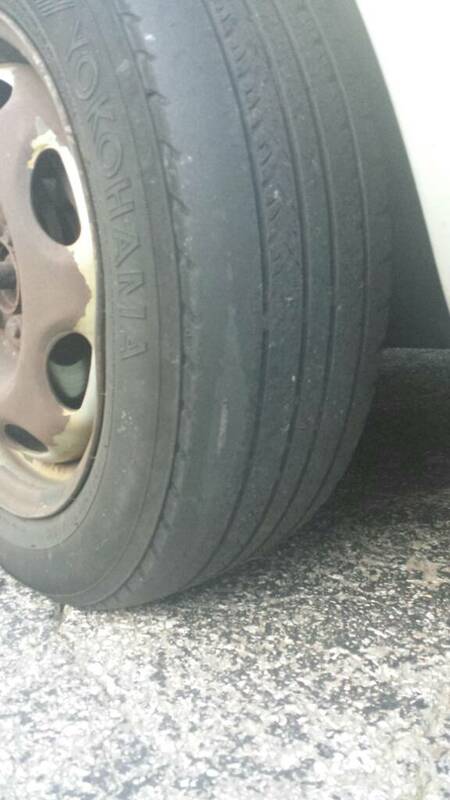 So I am getting a new car soon and don't want to put any money into my old car... How bad is it to drive on this tire?city? Highway? Do you care about having control of the car on a wet road?